Pines are the shrub and tree species that belong to the genus Pinus. These are evergreen conifers, which have bundles of needles rather than the broad leaves commonly found on deciduous trees. Below, you can discover 40 common species of pine tree, many of which have been planted or migrated well beyond their original native range. One common way to categorize pine trees is by how many leaves (needles) there are per bundle (fascicle). Aleppo pine is an extremely drought-resistant specimen that is a valuable landscape tree in hot climates, such as that of southern California. The needles are a light yellowish-green. In some parts of the world, it is regarded as an invasive species, since it has a habit of taking over areas burned off by fire. Aleppo pine is a very large tree with an irregular shape. It works best on large properties where it has room to grow unimpeded. This medium- to large-sized conifer transforms from a pyramidal shape to a rounded-top specimen when fully mature. It can be used as a specimen tree in the landscape or for screening purposes, but it is susceptible to a variety of pest and disease problems, especially in the Midwest. This slow-growing, long-lived tree native to the southern Rocky Mountains makes a great specimen tree in the landscape, where its small size is perfect. It is a dwarfish species that can be used as a shrub or allowed to grow to small tree size. This very large tree gradually develops a parasol-like canopy as it matures. It is a very sturdy, durable tree that tolerates most soil types. However, it does not tolerate cold. It is not a common landscape tree but is often farmed for its valuable, aromatic lumber. This large pine native to the Himalayas is an important forestry tree in Asia, although the wood is inferior to that of many other pines. It has no meaningful landscape use but is sometimes planted in the far South for use in construction and furniture making. Coulter pine is a large tree with an irregular crown and very large, heavy cones. Native to the coastal mountains of California and northern Baja California Mexico, it prefers rocky soil at medium altitudes. It is sometimes planted as an ornamental tree in parks and large gardens and has no commercial use, except as firewood. This fast-growing, long-lived pine is one of the most important pine species in North America, grown both for timber and for landscape purposes. It is by nature a large tree but accepts pruning so readily that it can also be kept trained as a hedge shrub. This is a somewhat rare pine that is most commonly found at or near the tree line in the Sierra Mountains. It is almost never grown as a landscape tree, but nature lovers find it beautiful when coming across it in natural settings. Gray pine is a tall pine with an unusual forked trunk. The tree is found in low foothills of the California mountains, but it is rarely planted in landscape applications. 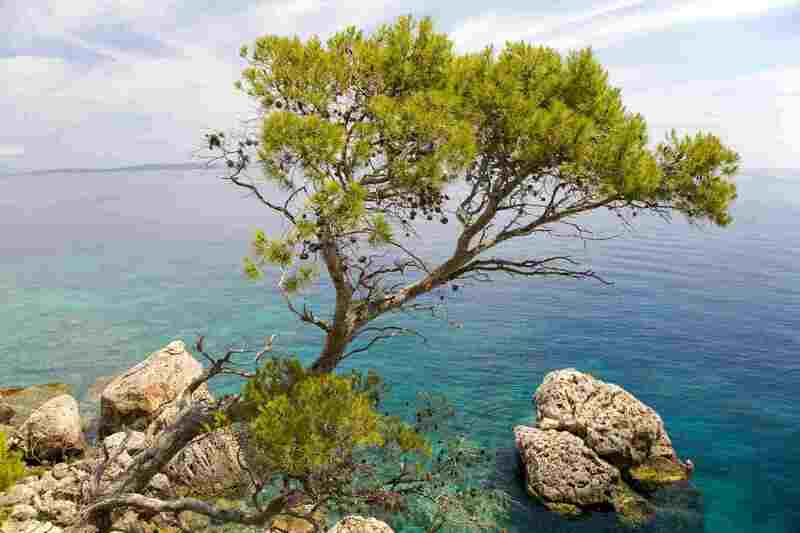 Italian stone pine is a classic umbrella-shaped pine from the Mediterranean. It has a very attractive form, but it is rarely grown in U.S. landscapes. It has edible pignoli nuts in Mediterranean regions. The tree is sometimes planted commercially as a food crop. Jack pine is a somewhat scruffy, shabby-looking pine that is rarely used in landscapes, but its tolerance for poor soils can make it a good choice for windbreaks in rural settings. Japanese black pine is an attractive, conical-shaped pine that can make a good specimen tree in the landscape. It is also sometimes used in bonsai craft. It is regarded as an invasive plant in Pennsylvania and a few other Atlantic coast states. Japanese white pine is a medium-sized tree that is a common specimen tree in the landscape. As the tree matures, it develops an attractive spreading branch pattern and flat top. It is also a favorite for bonsai enthusiasts. Jeffrey pine is a very tall but sparse tree that is rarely grown in landscape applications. It has a good tolerance for drought and poor soils. The bark smells like vanilla. It is regarded as invasive and undesirable in much of California. This tree has an exfoliating bark that looks similar to that of the sycamore. It grows quite slowly, taking 50 years to reach a mature height of 50 feet. Its attractive bark makes it a favorite landscape specimen. Limber pine is a highly adaptable tree that does well in difficult soils. When planted in landscapes, it is used for challenging conditions, such as where soil is bad. Loblolly pine is naturally found in swampy areas in the Southeast, and its landscape uses are mostly confined to that region for damp, boggy soil conditions. It has a very straight trunk, and as it ages, the tree loses lower branches so that the crown towers far above the ground. Depending on the subspecies and variety, the lodgepole pine is a shrub or tree. As the botanical name contorta hints, the trunks on the tree tend to be twisted and contorted. Rarely used in landscape planting, this pine does have commercial use as a source of construction lumber, poles, pulpwood, and veneers. Botanical Name: Pinus contorta subsp. Size: 3 to 80 feet tall, depending on subspecies. Longleaf pine is a very tall, upright tree with a straight trunk. It has few uses as a landscape tree but is a valuable commercial tree for lumber and pulpwood. Its needles are 8 to 18 inches long, the source of its common name. This large pine with angled branches and a flat crown is a rare tree, originally found only in Okinawa. It can be a good tree for shoreline landscapes. Maritime pine was originally highly prized as a source of timber and resins, but its attractive upswept branches and conical crown make it equally valuable as a landscape specimen. This unique-looking pine has drooping tufts of needles that give the tree a droopy, weepy appearance. An important lumber tree in its native Mexico, this tree makes a very unique specimen when planted as a landscape tree. Monterey pine is a large-bodied tree with a thick trunk and branches. It is a very versatile species with commercial uses as well as common landscape uses. Native to the foggy coastal areas of California, it has been introduced to New Zealand, where it is now the most prevalent tree for timber. Size: Shrub (3 to 6 feet) or small tree (10 to 18 feet), depending on variety. Historically, pitch pine was a major source of pine resins used in everything from Native American canoe-building to railroad ties. Its crooked growth habit and somewhat shabby overall appearance give it little usefulness for timber or for a landscape specimen. Pond pine is a species known to hold its seed cones closed for many years, opening them only after a fire has scorched them. Older trees become thin and ragged. Pond pine is increasingly used commercially for pulp. The immense size and large, straight, thick trunks have made the Ponderosa pine one of the most prized of all species for commercial lumber. It is frequently seen as an ornamental specimen in parks and large landscapes. The red pine, also known as the Norway pine, is a tall, straight tree with a conical crown that becomes rounded with age. It makes a good landscape specimen plant in the northern part of its range, zones 2 to 5. As the name implies, the sand pine prefers sandy, well-drained soils. 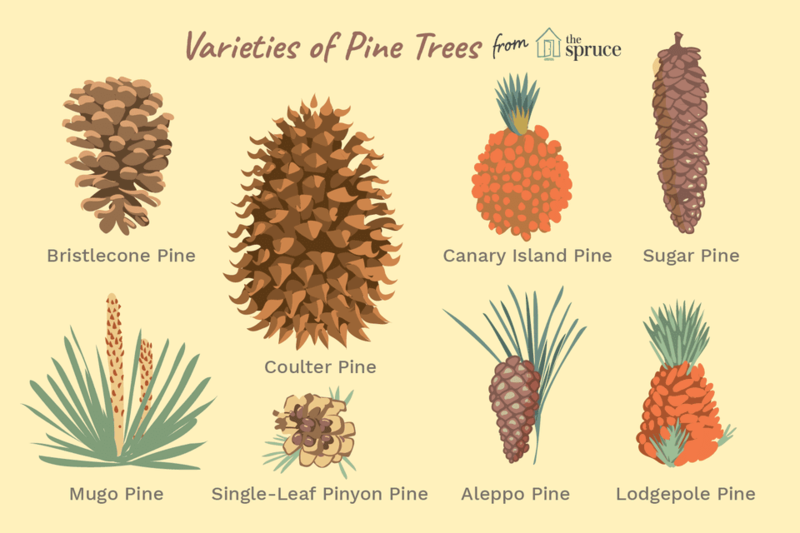 It is a medium-sized pine that does well in shady conditions, and some types have serotinous cones, which require fire before they will open and expel their seeds. Sand pines are not often used for landscape plantings, but young trees are sometimes farmed as Christmas trees. Scotch pine is a fast-growing, medium-sized tree with a conical or column-shaped habit and distinctive flaking brown-red bark. Commercially, it is grown as a Christmas tree. Smaller dwarf varieties make good landscape specimen trees. Single-leaf pinyon pine is a small- to medium-sized tree with flaking bark and single needles. In some regions, it is used as a Christmas tree but is rarely used in landscape plantings, since it is difficult to propagate. Sugar pine​ ​is the tallest of all pine trees with very longest cones—nearly 2 feet in length. Its sheer size makes this tree impractical for landscape use. Pinus densiflora is the most common of all pine trees native to Japan, and "Umbraculifera" is a dwarf variety usually grown as a shrub or small tree. It is often used in foundation plantings and is sometimes grown by bonsai enthusiasts. Botanical Name: Pinus densiflora "Umbraculifera"
Tenasserim pine is a medium- to a large-sized tree with orange-red bark. It is closely related to the Aleppo pine. The crown of the tree gradually becomes rounded as the tree ages. It is sometimes planted as a landscape specimen tree in warm climates. Torrey pine is a rare species, found only in the coastal sage and chaperral areas of southern California. It has a broad, open-crowned growth habit that becomes twisted in fantastic shapes by coastal winds. Where it appears, the Torrey pine is usually protected by law. Turkish pine is a very popular ornamental tree for warm climates. Several cultivars are available with remarkable tolerance for heat and drought. It has attractive, deeply fissured red-brown bark. Two-needle pinyon is a small- to medium-sized pine with furrowed and scaly bark. It is considered a two-needle variation of the single-needle pinyon pine, and the pine nuts are edible. It is sometimes planted as a landscape specimen tree and can be farmed as a Christmas tree. This tree is a small- to medium-sized specimen that is a good choice for providing winter accent in the landscape. Some cultivars turn a very attractive yellow-gold in winter. It is often farmed for Christmas trees. Western white pine is related to the eastern white pine, and is one of the largest of the pines, occasionally reaching 200 feet. It is too large to be commonly used in landscaping, but in its native habitat (the northern states of the Pacific Northwest), it can be found in the mountains and at sea level. Whitebark pine is closely related to the limber pine, and like that tree, the whitebark thrives at high elevations near the treeline in mountainous regions of the western Rockies and Sierras. It is a somewhat scrubby tree and is rarely used in landscape plantings. This tree is a threatened species in its native range.